Balanced Nutrition - R.W. Griffin Feed, Seed & Fertilizer, Inc. Balanced Nutrition is vital for both plants and animals alike. It is essential for optimum growth as well as for resistance to stress. Eighteen nutrients have been proven essential for crop development. Of these, Nitrogen (N) is needed in the largest amounts by most non-legume crops like corn, wheat, cotton, pecans or forage grasses. Potassium (K) often comes in a close second, especially as we strive for top-profit crop yields. But let’s focus upon a few N facts for this Spring. • N is an investment. Remember cost/lb N applied might not equal cost/lb utilized by the crop. Why? The Source might contain its N as urea, or as the ammonium or nitrate form … or a mixture of these. Some factors to consider are the initial cost/lb of N, the cost of application, risk of N loss to groundwater or the atmosphere, and cost of additives applied to protect against risk of loss. • Risk of N loss from urea by volatilization is well known. This risk can be reduced by incorporating the urea into the soil, irrigating it in or applying protective coatings. These practices can add to the cost/lb N and still leave some N at risk. 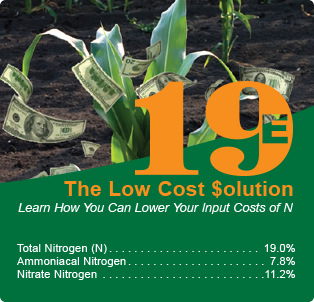 Other sources, such as an 18-0-0-3 solution , contains N in the low risk NH4+ and NO3- forms and also delivers sulfur (S) needed for optimum crop use of N. Retail dealers can help select the N source(s) that can deliver specific crop N needs at a lowest cost/lb of N.
• Wheat fields are hungry for topdress N in February and March. Fall applied N helped boost crop establishment and heavy seedling tillering. February N can help stimulate more tillering in early Spring if needed. Remember, every tiller can deliver a wheat head full of seed. March delivers the remainder of total crop N needs. Be sure to apply adequate levels of K and S to insure best wheat use of applied nitrogen. • Pecan tree fertilization will be underway soon. Nitrogen is the nutrient most often limiting pecan growth … but it cannot do the job alone. Balance N with other variety and site-specific nutrient needs. Many thousands of acres of new pecan groves were planted in recent years. These and other young trees respond well to N sources containing nitrate N and ammonium N that is easily converted into the nitrate form. Extension specialists report research showing that injecting N solutions is an excellent best management practice for pecan tree development and productivity. • Corn and Cotton acres need planning attention now. Water is and will continue to be the biggest high-yield limiting factor. Seed specialists can help to select genetics that can meet yield/quality goals and deliver needed traits. Well limed and fertile soils are a must for all high yield crops. Certified Crop Advisors (CCA) and Extension specialists are excellent sources of up-to-date crop management knowledge needed to build top-profit, high-yield cropping systems for the 2013 season.